All of my recent blogs have been about my colon cancer journey. I have described the procedures and side effects. What I haven’t done is write about the good things that have come from this ordeal. 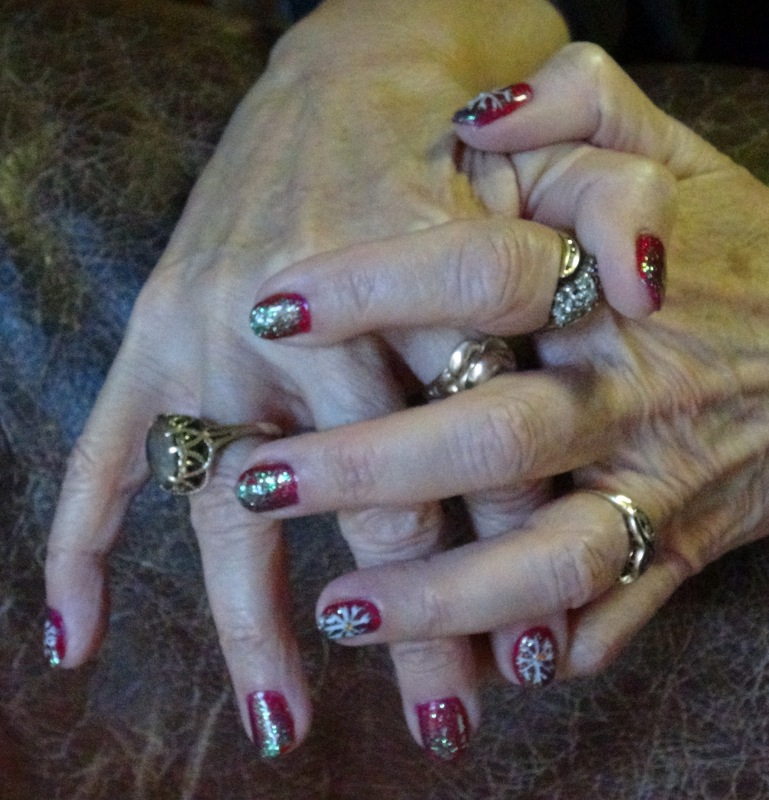 In some ways, my diagnosis was a gift, and it is the gift that keeps on giving – good and bad. My first chemo treatment ended nine days ago. Today I feel awesome. I have another treatment due in a week. I know I will feel like crap after that, but at least I had some time to recover. Today I got up about 7 AM, took a shower and headed out to beat the Christmas shopping rush. Normally, I HATE shopping! I hate shopping for me or anyone else. It is a pain in the A$$! Funny though, today I smiled through the entire process. It didn’t bother me one bit. I actually enjoyed it! The greatest gift I received from being told I have cancer? Not sweating the small stuff. I have plenty of big stuff if I want to stress. I am lucky to be alive with a hopeful outcome. It could have been a lot worse. Sure, it could still go south, but if I dwell on that, I will lose out on enjoying what is happening now. What a waste that would be! Ever since I can remember, I have been a hypochondriac. Every pain, every sore throat, every cough or twinge and I was convinced I was going to die. Shortly after my diagnosis, I stopped worrying. I was at peace. It no longer worried me. I had been told the worst of my fears. Yes, it could have been worse and still could be, but it doesn’t matter. I let go and accepted how things are now rather than how they might be. It was a relief actually – a HUGE relief. Somehow, getting angry, frustrated or stressed by small things now seems so silly! Instead, I have learned to love my life and the small things I once took for granted, now make me smile. Rather than being upset by traffic, I am grateful I am able to drive. Rather than getting upset that my meal didn’t turn out as well as I had hoped, I am grateful I can and want to eat. Rather than getting upset that my dog doesn’t perform a behavior the way I want, I am grateful I can work my dog at all. You get the picture. I am sad it took cancer to get me to appreciate life more and let go of stress. The Universe tried everything for the past 63 years to teach me that, but it took a cancerous 2×4 over my thick skull to get through to me. While I was sweating the small stuff, great things passed by me unnoticed. On my way out of the mall, I spied a nail shop. It was about 9 AM and there was nobody in there but two manicurists. Why not – I thought. So I went in and had another manicure. This one turned out even better than my other one! Unfortunately, the photos don’t do it justice, but you get the gist. 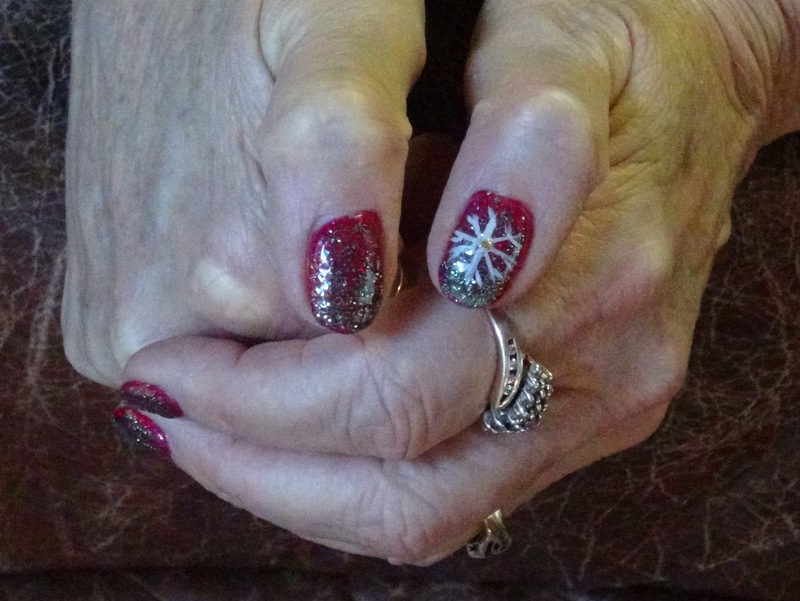 She painted snowflakes on four nails and placed a gold sparkle in the center of each one. What you can’t see in the photos is how sparkly my nails are. They are so festive! I LOVE THEM! They make me smile. That is what life has become for me. I try to smile as much as I can and let go of things that used to make me stress. I am grateful to be here and be able to experience so many wonderful things in my life. You surely have a way of putting into words what I feel or have felt … love it!!! Wonderful post Helen, something we all need to remember. What a great outlook, Helen. I need to take your words to heart and stop worrying about the small stuff, which I tend to do at times. And, may you and Mel and the doggies have a nice Christmas and a happy, healthful 2014. And, your nails look great! Good attitude….Merry Christmas to All! MERRY CHRISTMAS. As Tiny Tim would say in a Christmas Carol, God Bless us all.